TechnoProzium: Intel core i3-7350K performance analysis: unlocked, overclockable and overpriced? Intel core i3-7350K performance analysis: unlocked, overclockable and overpriced? One of the more interesting highlights of the Kaby Lake launch was the introduction of a multiplier unlocked core i3-7350K. Traditionally, the “K”-stamping which denotes the unlocked status of an Intel CPU is reserved for much costlier chips, namely the highest range i5s and i7s; dual-core i3 processors on the other hand represent excellent value thanks to their lower prices. So, when the news broke of an overclockable i3 - many enthusiasts, especially those on a budget, thought they’d found the dream chip. After all, not everybody can afford a 21K i5-7600K to entice their overclocking urge! We however wasn’t particularly captivated by its price tag and decided to hold our opinion for a later day. Meanwhile some of the leading hardware review-sites have recently published benchmark results of i3-7850K and that gives us ample reasons to go back and tackle the question of whether or not this is the right processor for you. The last time one could overclock an i3 processor was back in the Clarkdale era (an i3-540 still is on sale at Amazon.in!) before Intel decided to put a cap on entry level overclocking. However, demand for such affordable chips which could be tweaked to extract some extra performance remained strong among enthusiasts and power-users alike. The instant success of Intel’s Pentium G3258 “anniversary edition” which came with an unlocked multiplier once again proved that fact. The entire “Sky-OC” saga could be another contributing factor in the making of i3-7350K! During last year’s skylake launch, many enthusiasts claimed to have overclocked their non-K processor by increasing the base-clock with some motherboard vendors like Asrock and Supermicro even going as far as providing external clock generators on their boards to facilitate such efforts! Obviously, Intel didn’t take this unofficial trend of overclocking too kindly and quickly came up with firmwire to patch-up the loophole. Interestingly enough, some websites reported that a big percentage of those opting for Sky-OC were actually i3 users – a fact that Intel surely took notice of. Finally, there is the Ryzen factor! In recent times, it’s the lack of innovation on AMD’s part what has lead to Intel’s highly aggressive segmentation and capping of features such as overclocking, Turbo Boost, and Hyper-Threading within its own product stack. With Ryzen, things are going to change and it seems that AMD finally has something to compete with Intel in every price category. Under the circumstances, it’s only natural for Intel to put the best foot forward which is its excellent single-thread performance and power efficiency. 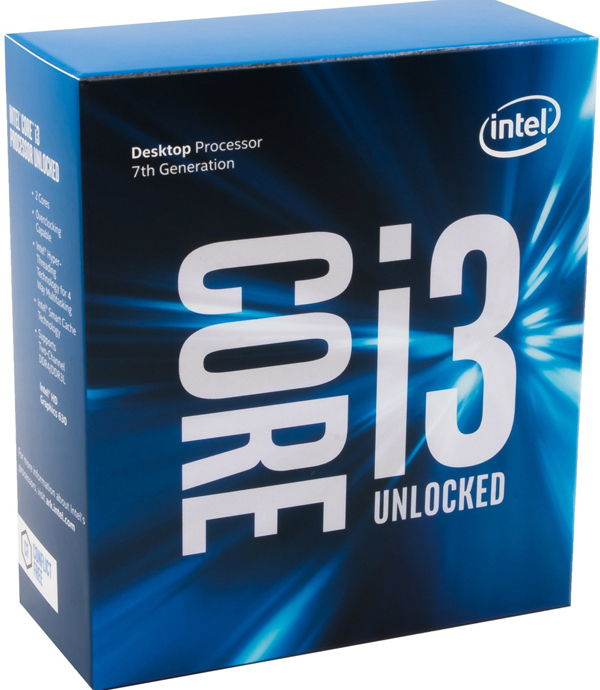 Enters the core i3-7350K – a 2core/4-thread processor based on Socket LGA1151, featuring a base Frequency of 4.2 GHz, 4MB of L3 cache with unlocked multiplier to boot. Here is a list of Intel’s 7th generation Kaby Lake processors and if you want to read our in-depth coverage on the matter click here. Surprisingly, you can build a system with i5-7400 or even a -7500 which costs slightly higher but offers higher clocks and save quite a significant amount of money over an i3-7350K build and that’s not something you hear everyday! You can further tweak the combination by using cheaper H110 motherboard or settling for a cheaper cooler but we believe the outcome won’t change by much. The biggest dilemma here is that the i5 is a genuine quad-core and overall a better processor out of the box. The i3 on the other hand is a dual-core with hyper-threading and can be overclocked to a much higher frequency. So question is which one you should go for? To answer that, we need solid head-to-head performance data. Thankfully, some of the big boys have already published their i3-7350K benchmark results and we’re going to use those to reach a conclusion. Tom’s Hardware – Folks at the Tom’s managed to push their review sample to a staggering 4.9GHz and thanks to that the i3-7350K scored some impressive numbers under workloads that favor high clock-speed over core count such as PCMark 8, Lame Audio encoding and Microsoft Office suite. It did particularly well in Adobe CC tests such as Photoshop, Indesign and illustrator. However, once exposed to productivity oriented apps which tend to be well optimized for multi-core operations, the i3 starts to hit its limitation and the i5-7400 takes the lead in Adobe After Effects, 7-Zip, Cinebench - multithread, Handbreak and Blender despite of its significantly lower clock-speed. The gaming test included a bunch of demanding AAA tittles such as Ashes of Singularity, Hitman, GTA-V, Battlefield 4, Metro: Last Light Redux and Project Cars. It’s the i5s that clearly dominate the gaming charts and while the i3-7350K isn’t far behind it seems that we’ve reached the point where a true quad-core is a bare minimum these days. AnandTech – AT got a similar OC out of their sample but oddly enough tested the chip in its default 4.2GHz core frequency! Results show the i3-7350K doing very well in Office and Web benchmarks but falling short in heavily threaded workloads. The slower i5-7400 wins in compression, rendering and particle simulation – establishing the importance of parallel execution (read core-count) in today’s professional environment. Gaming is once again a graphical deadlock with most Intel processors flocking within tight proximity and even a six-year old i7-2600k has no difficulty handling modern tittles. HardwareCanucks – These guys probably received a “golden sample” and got a monstrous 5GHz overclock! But even that high an OC can’t offset the lack of physical cores in the i3 which is evident in Hardwarecanucks’ AIDA64 test-suite results where it often trails to the older i5-6400! The rest of the results fall in-line with findings of other reviews. After going through all those data from their respective sources, it seems that we were quite right in our initial observation. The i3-7350K is quite an odd beast and finding its rightful place in the long hierarchy of desktop processors isn’t the easiest of jobs. Out-of-the-box, it delivers excellent single-thread performance thanks to blistering 4.2GHz base clock which is great for office programs, web applications and most of our day-to-day windows operations. However, all the Kaby Lake i3s (and Pentiums too!) come with very high clock-speeds and even the cheapest i3-7100 can deliver an equally snappy experience for aforementioned workloads. Yes, we know that you’re not going to buy a CPU with unlocked multiplier to run it under default settings. And as far as we’ve learnt, the i3-7350K is a decent overclocker – just don’t expect your retail chip to reach the level of those cherry-binned review samples! It’s been a silicon lottery with Intel CPUs lately when it comes to OC. Depending on your draw of luck and cooling capacity, a 4.5-4.7GHz seems like a practical target to us. However, once you take the cost of a Z-series motherboard and aftermarket CPU cooler into account, the overclocking starts to look like a very expensive affair! For almost the same amount of money, an i5-7400 offers two extra physical cores and is a better candidate for any kind of professional and productivity oriented workload. If you use your PC for 3-D rendering, virtualization, video mixing and transcoding or heavy-duty photo editing – go with the i5-7500 if budget permits as it has a better balance between frequency and core-count. From the gaming benchmarks it’s clear that the extra megahertz doesn’t provide any tangible benefits and considering the multi-core optimized natures of next-gen APIs like DX-12 and Vulcan, a dual-core processor isn’t a futureproof solution either. A gamer on budget should spend his/her money elsewhere i.e. better graphics card. As it turns out, the i3-7350K is kind of a special chip and geared more towards the casual tinkerer than the serious enthusiast. The value associated with general overclocking is also absent here making it a product hard to recommend. We are sure we’d love this CPU if sold around a base price of INR.12K but at its current price point you’d rather skip this one.